This weekend SHOFCO hosted the first annual Kibera World Cup! 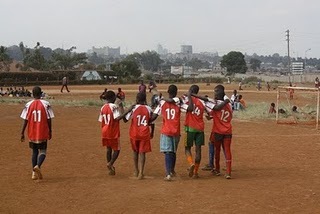 Twenty youth soccer teams (boys 16 and under) from all over Kibera competed in the two-day tournament. The games coincided with the final games of the actual World Cup in South Africa and mirrored its structure. On the first day, teams were placed into lettered groups where they played “round robin” style. Two fields, three referees, and forty games in one day! Winners from each group competed in the knockout rounds on the second day, including the quarterfinals, semifinals, and a big final match at the end of the tournament. SHOFCO’s 16 and under team finished 4th place, after a tough penalty shootout loss to “More Fire” in the semifinals (Other creative team names from the tournament include: “Super Disc”, “Lexus”, and “Mexico”). Eventually, “More Fire” defeated “Mexico” in an exciting final game that all of the teams stayed to watch. The top four teams in the tournament all won official World Cup soccer balls and cash prizes, handed out in a closing ceremony at the end of the game. 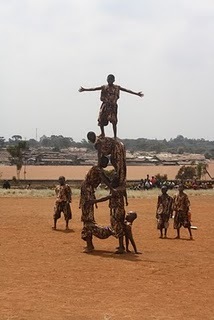 During the event we also enjoyed performances from the acrobatic dance troupe “Kibera Hamlets”, as well as an exuberant skit from the SHOFCO youth drama team based on HIV/AIDS awareness. We also had face painting and balloons for the younger kids, as well as juice, soda, bread, and biscuits for the players and fans all watching. Before the final match, the Shining Hope volunteers (“Team Obama”) were challenged to a friendly match against the SHOFCO girls soccer team, which was a lot of fun, but highlighted our embarrassing mzungu soccer skills. Hundreds of people came to watch the games, especially kids, and everyone had a blast! This amazing community event would not have been possible without our amazing youth soccer director, “Coaches” (his nickname – his real name is Ken, but he’s known by everyone as “Coaches” so there’s no confusion with our boss Kennedy!). Not only does he organize and coach all of SHOFCO’s youth soccer teams, but he organized the entire event with Leah, our incredible Development Director. All in all, it was a great weekend for SHOFCO and a perfect way for the community to celebrate the World Cup!